War had been declared just 19 days earlier, and the army had set up a training camp on the grounds of the Awapuni Racecourse, Palmerston North. The military camp at Awapunu is the largest in New Zealand, and it is understood it will be continued for some time. General Godley expressed himself yesterday as highly delighted with the arrangements and suitability of the site for military training. The Manawatu Racing Club has been warmly thanked for placing their grounds at the disposal of the military authorities. Fresh troops are expected to arrive shortly for training purposes. His medical examination describes him being 5 foot 9 inches tall, weighing 11 – 4lb and having a dark complexion, brown eyes, and dark brown hair. His religious profession was Roman Catholic. Distinctive marks: Tattoo, Clasped hands Left, Clasped hands Right, H. Cavender on Right arm. He was assessed fit and he joined the Wellington Infantry Battalion as a Private with the regimental number of 10/800. “AWAPUNI CAMP”, Hawera & Normanby Star, 25 August 1914, page 7; digital image, National Library of New Zealand, Papers Past (http://paperspast.natlib.govt.nz/ : accessed 01 Aug 2011). 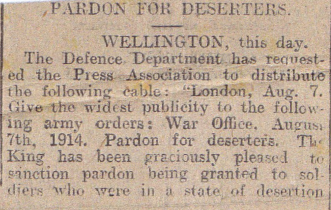 “PARDON FOR DESERTERS” and Untitled clipping, clippings from unidentified publications, dated August 1914; photocopy, original held by [NAME AND ADDRESS FOR PRIVATE USE], grandson of Alexander Wright.